Escape to a Tuscan style villa set on over 3 acres of landscaped grounds adjoining pristine escarpment rainforest, with panoramic views of the escarpment and Broughton Head. Tuscany is the perfect place to stroll along a quiet country lane, catch a glimpse of the wombats and wallabies visiting the grounds, enjoy a barbecue in the garden courtyard or just relax in front of the open log fire. - Three full sized bedrooms each with queen size beds. 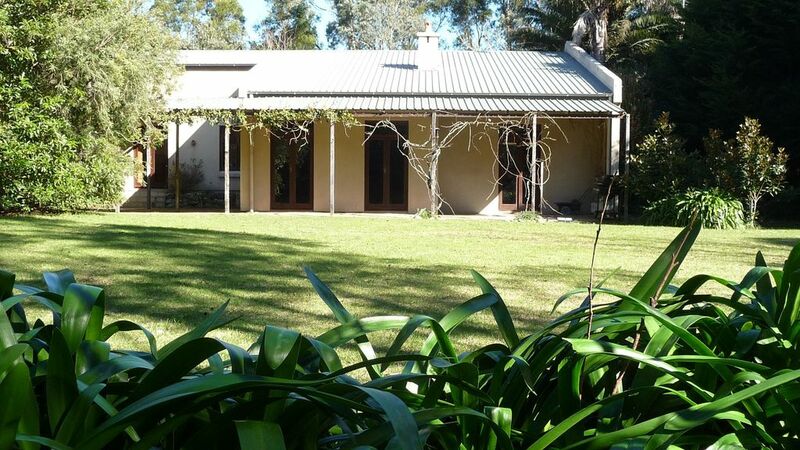 Tuscany on the Mountain is an idyllic mountain retreat atop Berry Mountain (Bellawongarah) on a quiet country lane located just 8 km from Berry township and 8 km to Kangaroo Valley. The house has views of the escarpment and views to Wattamolla valley. Berry, well known for its restaurants and antique shops, is situated only 5 minutes from the beautiful Seven Mile Beach and 30 minutes from the world heritage area of Jervis Bay. The accomodation had everything we need for a relaxing weekend. The host provided all information we required. The place is close to berry as well. We found this house very homely, it was well set up to accomodate 10 people. The complimentary bottle of red was very appreciated! It felt private with a large lawn garden to explore, 2 wombat holes were found. Very important to note is that mobile reception ends at the driveway, and the wifi didnt work once in the weekend (in spite of the stong wifi signal showing on the phone). Had a wonderful long weekend stay at Tuscany at Berry Mountain. The house may not be the most modern accommodation on offer but it is very spacious and well equiped, has a nice open fire, numerous comfortable sofas for relaxing and is quite reasonably priced for what you get. We particularly enjoyed the extensive gardens and grounds. A beautiful setting! Although we found some wombat burrows during our daytime explorations unfortunately we did not get to see any wombats on our night walks. Maybe next time. A big house, comfortable and very clean, beautiful grounds! !, fully equiped with everything you would need to spend a nice and relaxing long weekend like we did. The massive grounds are the definite highlight of this property. Even with a lot (and I mean a lot!) of rain, we still managed to go exploring looking for Wombats and other wildlife and the kids loved it! You could easily spend hours in the grounds on a better day. I also loved that there was no mobile coverage. The house itself has seen better days. Their was a general mustiness smell when we arrived (which is sometimes normal for country rental properties of course) however the 3rd bedroom was unusable due to the overpowering smell. There was also a small leak in the main living room roof which I have let the owner know of. Overall, impressed with the grounds, not that impressed with the property itself. Thank you for your feedback. We regret that you had an issue with a musty smell in the library. We have never had a complaint of this in the past but we will certainly investigate this. We hope to welcome you back at some future time.